December 31st is undoubtedly one of the most anticipated days of the year. Shaped by traditions, speckled with customs, and colored with culture, New Year’s Eve marks a paramount moment in time. Encapsulated into one day, the memories of the past 12 months spark revolutions and resolutions, setting the tone for the next 12 months to come. When December 31st approaches, all eyes eagerly look to the Windy City for the ultimate celebration. Naturally, every bar, restaurant, nightclub, and event space in Chicago proclaims to be hosting the "biggest," "best," and "most exciting" New Year's Eve event of the year. But there can only be one, and if you were in Chicago around this time last year, chances are you heard about the Resolution Gala. This year, we are pleased to announce that the 6th Annual Resolution Gala at the Navy Pier will be the premier Midwest New Year's Eve event! The lights of the AON Grand Ballroom are illuminated, the cameras are flashing in Lakeview Terrace, and the glasses are raised in the Lake Michigan Room-- these are the sweet beginnings to a new year. Crystalize the moment and toast to an unforgettable evening of unmatched glamour and revelry. 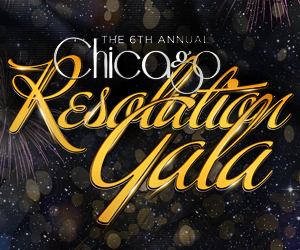 Presented by ChiTownEvents.com, the 6th Annual Resolution Gala is Chicago's marquee event for New Year's Eve. Year after year, the remembrance, revolutions, and resolutions that build up to the paramount final countdown define New Year’s Eve as the greatest night of the year for celebrations. It’s hard to describe the electricity and excitement in the air as the biggest crowd in ChiTown cheered on the clock and welcomed in 2018 as fireworks lit up the sky. However, why try and recap what was, when you can experience it for yourself this coming December! The 6th Annual Chicago Resolution Gala is once again taking over the Navy Pier, and this year's event it expected to outdo all the rest. Looking to closeout the year with a bang? This is Chicago’s Largest New Year’s Eve Party! The venue features over 30 bars, where a premium hosted ticket reception will be available to everyone in attendance from 8:15PM to 2:00AM. Additionally, plenty of bathrooms will be at your disposal, limiting those long lines that everyone's used to on a night like this. Grab your cocktails and prepare your toast for Chicago’s megawatt NYE event! Guests will be greeted with party favors and noisemakers to add to the festivities, and music is supplied throughout the party by 4 world renowned Live DJs, including B96's mixmaster and the famed Chicago Bulls music coordinator, DJ Metro. The most anticipated New Year's Eve party in the city will also feature an incredible food spread sure to impress the palate. You'll be able to indulge in a stationed buffet featuring delectable bites created by Chicago Signature Services. From the savory Pasta Primavera to the Roasted Wild Mushrooms, you’ll want to come with an appetite to enjoy all of the dishes offered on this night! Enjoy access to three distinct rooms in one supreme party for the ultimate night of exuberance. Mix and mingle in Lakeview Terrace and Grand Ballroom, two of the most popular and sought after event spaces in the city. You'll have access to each by attending the Resolution Gala. Whether you spend the night dancing in the Lake Michigan Room or lounging on the exclusive Balcony, there's plenty to see and experience to keep you busy throughout the night. When you're ready for the action at the end of the evening, head outside to an exclusive private space to catch the fireworks show at the strike of midnight, and toast the night away with family and friends. There's no denying that this is the most exclusive New Year's Eve ticket in Chicago. Now's the time to get yours, and count down to a night that you'll never forget.